The liner notes of this release brought me up short, stating that Telemann was “wearied by a crushing workload” in 1737, and “contemplated taking a break in his professional life” with a trip to Paris. The composer did indeed go to Paris, but not for a vacation: He went to purchase a royal warrant to prevent further pirated editions of his work, and to increase financially rewarding subscriptions of his scores by composing more, and securing numerous performances at the Concert Spirituel. His warrant wasn’t at all successful at decreasing piracy, so that even the publisher Le Clerc, with whom he signed an agreement to reissue some older chamber music and publish some new ones, returned to issuing unauthorized Telemann scores within three years. The performances and subscriptions, however, were a great success, with Telemann, who was a workaholic that loved accepting as many commissions as possible, turning out many new compositions during his stay to attract buyers: a French cantata, a comic symphony, numerous concertos, a collection of trios, two psalms for amateur performance, and a group of flute quartets. The 12 flute quartets (called variously sonatas, suites, concertos, and quartets in the original publications) were not entirely original to Paris. Half were composed there in 1738, while the other half were reprints originally issued in Hamburg in 1730. The stylistic blend is not perfect to our ears, as the later works personify les goûts réunis, while the earlier add a stronger thematic and harmonic North German element. But that was evidently less important to Telemann’s listeners, who admired his well-known ability to assume the mantle of musical styles as diverse as sleek Venetian keyboard sonatas, and rustic Silesian fiddling. Presumably what mattered to them was the technical finesse, imagination, and expressive qualities he poured into his works, and the opportunities they provided for strong soloists to display their skill. 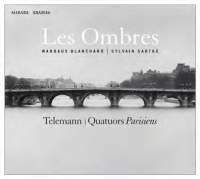 I previously reviewed Les Ombres in Couperin’s Les Nations (Ambronay 035; Fanfare 36:4), where I praised its crisp playing, varied tempos, and delicate, stylish ornamentation. All this holds true here as well, but there’s a stiffness to changes of tempo in phrases encompassing cadence points that compares poorly to the more flexible approach taken by Jed Wentz’s Musica ad Rhenum (Brilliant Classics 93649). It also should be mentioned that this disc holds the slowest fast tempos I’ve yet heard in Telemann’s flute quartets. Even Wentz, who preferred relaxed tempos in movements marked vivace, vite, and allegro, moves along at a faster pace than Les Ombres, while Sigiswald Kuijken’s version (Sony 63115) shows just how much wit can be found by an ensemble that brings meticulous playing, rhythmic spring, and great energy to such passages. It doesn’t help that there are a few instances of imprecision, such as the flutist going briefly off pitch at 3:21 in the Sonata I’s third movement. Sylvain Sartre is an excellent performer whose music-making I’ve enjoyed on numerous occasions, so I can only put this down to lack of extra recording time in the studio. Still, whatever the cause, it hurts the overall effect. In short, my preferences still remain with Wentz and Kuijken, though there’s much to admire here, particularly in the way the slower tempos permit a slight degree of ornamentation.